Author contributions: Cozma-Petruţ A and Dumitraşcu DL contributed to the literature search and manuscript writing; Loghin F and Miere D contributed to the scientific content and revision of the manuscript; Dumitraşcu DL gave the study idea, the final revision of the article. Conflict-of-interest statement: All authors declare no conflict of interest related to this publication. A substantial proportion of patients with irritable bowel syndrome (IBS) associate their symptoms with the ingestion of specific foods. Therefore, in recent years, scientific research has increasingly focused on the role of diet in IBS and dietary management is now considered an important tool in IBS treatment. This article reviews the main dietary approaches in IBS emphasizing evidence from experimental and observational studies and summarizing the main diet and lifestyle recommendations provided by dietary guidelines and scientific literature. Despite the limited evidence for a beneficial role, general advice on healthy eating and lifestyle is recommended as the first-line approach in the dietary management of IBS. Standard recommendations include adhering to a regular meal pattern, reducing intake of insoluble fibers, alcohol, caffeine, spicy foods, and fat, as well as performing regular physical activity and ensuring a good hydration. Second-line dietary approach should be considered where IBS symptoms persist and recommendations include following a low FODMAP diet, to be delivered only by a healthcare professional with expertise in dietary management. The efficacy of this diet is supported by a growing body of evidence. In contrast, the role of lactose or gluten dietary restriction in the treatment of IBS remains subject to ongoing research with a lack of high-quality evidence. Likewise, further clinical trials are needed to conclude the efficacy of probiotics on IBS symptoms. Core tip: In recent years, dietary management has shown promise as a key tool in the treatment of irritable bowel syndrome (IBS). This article gives a high topical review of dietary approaches in IBS treatment and evaluates the current evidence to support their efficacy in the improvement of IBS symptoms. On the basis of diet and lifestyle recommendations in IBS, identified in dietary guidelines and scientific literature, the article provides the “IBS Food Pyramid”, namely a novel, visual, user-friendly tool for the dietary counseling of IBS patients by healthcare professionals. Irritable bowel syndrome (IBS) is a common functional gastrointestinal (GI) disorder, with a high global prevalence (11.2%) and a strong impact on the quality of life[1,2]. According to the Rome IV criteria, the syndrome is defined as recurrent abdominal pain for at least 4 d per month over at least 2 mo, associated with one or more of the following: related to defecation, a change in frequency of stool and/or a change in form or appearance of stool. IBS can be classified into 4 subtypes: IBS with predominant diarrhea (IBS-D), IBS with predominant constipation (IBS-C), IBS with mixed bowel habits (IBS-M), and IBS unclassified (IBS-U). The pathophysiology of IBS is not completely understood, but several abnormalities appear to contribute to its pathogenesis, including disruption of the brain-gut axis, gut dysmotility, visceral hypersensitivity, low-grade mucosal inflammation, increased intestinal permeability, and altered microbiota. Moreover, a number of studies refer to the role of diet in IBS, which may be explained by atypical modulatory mechanisms of the gut in response to stimulation of gut receptors mediated by nutrients. Nutrients presence in the GI tract affects GI motility, sensitivity, barrier function, and gut microbiota. Likewise, food hypersensitivity and food intolerance have been targeted to underlie the pathogenesis of IBS, but there is a lack of quality evidence to support this mechanisms. Hypersensitivity to certain foods may play a role by causing low-grade intestinal inflammation, increased epithelial barrier permeability and visceral hypersensitivity. Bioactive chemicals in foods (e.g., salicylates) also may contribute and trigger GI symptoms in IBS, possibly by inducing visceral hypersensitivity following chronic exposure. Luminal distension is another mechanism by which food has been suggested to induce symptoms in IBS in that short-chain carbohydrates in the diet can increase luminal water retention and gas production, thereby leading to bloating, pain and increased visceral hypersensitivity[6,7]. Furthermore, at least two thirds of patients with IBS relate their GI symptoms to the ingestion of specific foods, making dietary management an important tool in the treatment of IBS[7-9]. Nevertheless, the anxiety about food and GI distress corroborated with the fact that typical dietary advice in IBS is focused more on what foods to avoid, often leaves these subjects with unnecessarily self-restrictive diets, which could result in nutritional deficiencies[10,11]. Therefore, it is of utmost importance for healthcare professionals to provide detailed dietary recommendations to IBS patients. This article reviews current evidence on the dietary management of IBS with particular emphasis on what to recommend to IBS patients. In the last part of the article, it is presented the novel “IBS Food Pyramid”, which we developed to summarize the main dietary and lifestyle recommendations in IBS, as identified in current dietary guidelines and the available literature in the field. Currently, there is a guideline consensus that diet and lifestyle advice should be the first-line approach in the dietary management of IBS[12,13]. Healthy eating and lifestyle advice can be provided by any healthcare professional with interest in IBS dietary management (e.g., primary care physician, gastroenterologist, dietitian). Typical recommendations are following a regular eating pattern and limiting the intake of potential dietary triggers, such as alcohol, caffeine, spicy foods, and fat[12,13]. Other recommendations include ensuring a good hydration and performing a regular physical activity[12,13]. Dietary guidelines[12,13] make recommendations of healthy eating habits in IBS patients, despite the limited evidence on the association between poor eating patterns and IBS. Several studies have reported more irregular meal habits in IBS patients than in healthy controls and suggested that irregular eating may affect colonic motility and therefore contribute to IBS symptoms[14,15]. Likewise, data obtained by questionnaire from binge and non-binge eating obese and non-obese women showed that the relative risk of IBS was 2-4 times higher among binge eaters, suggesting that consumption of large meals may induce GI symptoms in IBS. Recommendations on eating habits in IBS, according to dietary guidelines and/or scientific literature: (1) Patients with IBS should be advised to establish a regular meal pattern (breakfast, lunch and dinner with snacks as appropriate) and to avoid skipping meals, leaving long gaps between eating or eating late at night[12,13]; and (2) IBS patients should be recommended to avoid large meals as well as to take time to eat, to sit down to eat, and to chew food thoroughly[12,13,17]. Alcohol is known to affect the GI tract motility, absorption, and permeability. However, the evidence relating alcohol to IBS is limited. Studies on self-reported food intolerance have indicated a role of alcoholic beverages in GI symptoms among IBS patients[8-10]. In contrast, alcohol intake was not correlated with IBS in population-based studies[19,20]. Moreover, in women with IBS, GI symptoms like abdominal pain and diarrhea have been associated only with binge drinking (more than 4 drinks per day) and not with moderate (2-3 drinks per day) or light drinking (1 drink per day). These conflicting results on alcohol and IBS emphasize the need for conducting randomized controlled trials (RCTs) to evaluate the effect of low alcohol intake on IBS symptoms. Recommendations on alcohol intake in IBS, according to dietary guidelines and/or scientific literature: (1) alcohol intake should be assessed in relation to GI symptoms to determine if a reduction may alleviate them; and (2) IBS patients should be advised to consume alcohol in compliance with recommended safe limits, while having at least two alcohol free days a week[12,21]. Generally, safe alcohol limits are described as no more than 1 drink per day for women and no more than 2 drinks per day for men. A drink is defined as 12 oz of regular beer (5% alcohol), 5 oz of wine (12% alcohol), or 1.5 oz of 80-proof distilled spirits (40% alcohol). Coffee, particularly caffeinated coffee, has been demonstrated to increase gastric acid secretion and colonic motor activity in healthy individuals[23,24]. Coffee has also been reported to stimulate rectosigmoid motor activity and lead to laxative effect in susceptible people. Nevertheless, the role of caffeine in IBS is less clear. Several studies have indicated coffee and tea among the foods associated with symptoms by IBS patients[8,10,25]. On the other hand, habits of coffee drinking have not been noted to be more common among IBS patients than among healthy controls[18,19]. Moreover, there have been no RCTs to determine whether a low caffeine intake would lead to better clinical outcomes for patients with IBS. Recommendations on caffeine intake in IBS, according to dietary guidelines and/or scientific literature: (1) caffeine intake should be assessed in IBS patients and, if related to symptoms, daily intake should be restricted to 400 mg caffeine, which is the safe limit for most adults; and (2) sources of caffeine to watch for include coffee and tea, but also energy drinks, soft drinks, dark chocolate, and some over-the-counter analgesics. Many IBS patients report that the ingestion of spicy foods triggers GI symptoms, such as abdominal pain and gastroesophageal reflux[8,9,26]. Recently, a large cross-sectional study in Iranian adults reported that the consumption of spicy foods at least ten times per week substantially increased the likelihood of suffering from IBS in women but not in men. However, this study was performed in an Asian country, where the average daily chili consumption is 2.5-8 g/person, which is much higher than that of 0.05-0.5 g/person in Europe and America. Capsaicin is considered the active component in red chili responsible for the effects of spicy foods on the GI tract[29,30]. Capsaicin accelerates GI transit via the transient receptor potential vanilloid type-1 (TRPV1) causing a sensation of burning and pain in healthy individuals. Increases in the number of TRPV1 receptors have been found in subjects with disorders characterized by visceral hypersensitivity, including in patients with IBS[31,32]. Several studies have shown that supplementation of capsaicin exacerbates abdominal pain and burning in IBS patients[33,34]. It is to be noted that these studies have used high doses of spices as a treatment, whereas there is no reported data on the role of habitual consumption of spicy foods in IBS. Furthermore, there are studies to demonstrate a beneficial effect of red pepper in IBS, under conditions of chronic consumption. Nevertheless, in these studies, the analgesic effect of red pepper was obtained at the expense of an initial, although transitory, exacerbation of pain in the first weeks of treatment in some patients. Recommendations on spicy foods intake in IBS, according to dietary guidelines and/or scientific literature: (1) spicy food intake should be assessed in IBS patients and, if related to IBS symptoms, the intake should be restricted; (2) IBS triggers in spicy foods other than hot spices (e.g., fructans in onion and garlic) should also be assessed. An important proportion of patients with IBS relate symptoms to foods rich in fat[8,25,26]. As a consequence, the avoidance of fatty foods is one of the most frequent dietary approaches considered by IBS patients for symptoms improvement. Indeed, laboratory-based studies have shown that duodenal lipids inhibit small bowel motility and impair intestinal gas clearance, inducing gas retention and bloating[37,38]. This mechanism is up-regulated in patients with IBS. Duodenal lipids also enhance colorectal hypersensitivity with increased perception of rectal distension in IBS patients[39,40]. Despite such complex laboratory studies, the evidence associating dietary fat intake to IBS is limited. In particular, there are no reported RCTs to support that a reduction in fat intake would lead to symptoms improvement in IBS. A series of studies failed to identify differences in the intake of fat between IBS patients and controls[11,41]. Furthermore, recent findings suggest even a putative positive effect of dietary fat in IBS[42,43]. Polyunsaturated fatty acids and their metabolites can exhibit beneficial effects on intestinal inflammation. Given that low-grade inflammation has been recently revealed as a mechanism involved in IBS, the supplementation of polyunsaturated fatty acids in IBS patients warrants further research. Recommendations on fat intake in IBS, according to dietary guidelines and/or scientific literature: (1) if related to IBS symptoms during or after eating, fat intake should be assessed, while ensuring the intake is in line with healthy eating guidelines. According to FAO/WHO dietary recommendations, the total fat intake for an adult should range from 30% to 35% of total energy, without being under 15% of total energy; and (2) patients with IBS should be advised to limit fat intake to no more than 40-50 g/d. Although an increase in the intake of dietary fiber was long believed to improve IBS, particularly IBS-C, this view has largely been revised. In some patients with IBS, the use of fiber may actually exacerbate symptoms and increase abdominal pain, bloating and distension[46,47]. The efficacy of fibers in IBS has often been discussed in terms of soluble and insoluble fibers, with the recommendation to increase the intake of soluble fibers and decrease the intake of insoluble fibers, respectively. However, this approach may no longer be suitable. Fibrous foods such as psyllium or oats have both attributes and most plant-based foods contain mixtures of soluble and insoluble fibers. A more appropriate approach relies on the classification of fibers not only by solubility, but also by fermentability, viscosity, and gel formation, as follows: insoluble, poorly fermented (e.g., wheat bran), soluble, nonviscous, readily fermented (e.g., inulin), soluble viscous/gel forming, readily fermented (e.g., β-glucan), and soluble viscous/gel forming, nonfermented (e.g., psyllium). The readily fermented fibers can lead to rapid gas formation, while the poorly fermented and nonfermented fibers often result in less flatulence. The role of fibers in IBS remains subject to ongoing debate with a lack of high-quality evidence and contradictory data. A systematic review evaluated 12 RCTs involving 621 patients and found no beneficial effect with either soluble fibers or insoluble fibers over placebo for improving abdominal pain, global assessment or symptom scores. In contrast, a more recent systematic review and meta-analysis based on 14 RCTs including 906 patients concluded that soluble fibers, such as psyllium, may have some beneficial effects in IBS, whereas insoluble fibers, such as bran, do not appear to be beneficial and may even worsen symptoms. These data corroborated with the information on the fermentability of fibers, suggest that soluble viscous fibers with low rate of fermentation (e.g., psyllium) would be the most appropriate for both constipation and diarrhea in IBS patients. The addition of linseeds in the diet may also help in the management of constipation. Linseeds are a rich source of dietary fibers and, according to prior studies, ground linseed (6-24 g/d) relieved constipation, abdominal pain and bloating in IBS-C gradually over 3 mo. Recommendations on dietary fiber intake in IBS, according to dietary guidelines and/or scientific literature: (1) evidence is lacking on the optimal dose of fibers in IBS, but a gradual increase in total dietary fiber (naturally occurring and supplemented) to a target dose of 20-30 g/d should be suitable. IBS patients should however not be advised to increase their intake of wheat bran above their usual dietary intake; and (2) patients with IBS-C should be recommended to try dietary supplementation of linseeds of up to 2 tablespoons per day, consumed with fluid (150 mL/tablespoon), for a 3 mo trial. Improvements in GI symptoms from linseed supplementation may take up to 6 mo. Milk and dairy products contain lactose, a disaccharide that is not well digested by an important proportion of adults worldwide. This phenomenon is attributed to low levels of the enzyme lactase in the intestinal mucosa of these people. Undigested lactose is cleaved by gut flora into short-chain fatty acids and gas (e.g., hydrogen), products that are likely to lead to GI symptoms in case of milk ingestion. Typical GI complaints of lactose intolerance are similar to those in IBS and include abdominal discomfort, bloating, and loose stools. Furthermore, many patients with IBS attribute symptoms to consumption of milk and dairy products[10,52-54], but this self-reported intolerance does not always correlate with results from objective investigations, such as the hydrogen breath test[52,53]. Some trials have noted an improvement in IBS symptoms in response to a lactose-free diet among a substantial proportion of patients[55,56]. Despite such findings, all these trials were not blinded or controlled. The improvement of symptoms may be because some IBS patients have lactase deficiency. However, lactase supplementation did not alleviate IBS symptoms in one small double-blind, placebo controlled study. It is also plausible to hypothesize that other milk components rather than lactose may play a role in IBS. For instance, it has been suggested that milk intolerance could in some cases be related to the ingestion of the protein A1 β-casein. During digestion, this protein releases β-casomorphin 7, which is known to exhibit GI effects. Indeed, further research studies are needed to elucidate the role of milk and dairy products in IBS. Recommendations on milk and dairy products intake in IBS, according to dietary guidelines and/or scientific literature: (1) IBS patients should be advised to use a low-lactose diet only if they have a positive lactose hydrogen breath test; (2) If they wish to follow a milk-free diet, IBS patients should be informed that there is no high-quality evidence for this diet to improve their symptoms. In addition, patients should be informed that a milk-free diet could result in low calcium intakes and increase the risk of not meeting the daily calcium requirements[11,12]; and (3) In patients with IBS where sensitivity to milk is suspected and a lactose hydrogen breath test is not available or appropriate, a trial period of a low lactose diet is recommended. Despite no evidence from scientific research on the effect of fluid intake in IBS, current dietary guidelines recommend the daily consumption of up to 1.5-3 L of fluids. In particular, an adequate fluid intake is suggested to improve stool frequency and decrease the need for laxatives in IBS-C.
Water and other non-caffeinated drinks, for example herbal teas, are recommended as a beverage for patients with IBS[13,59,60]. In contrast, carbonated water and other carbonated beverages should be avoided by IBS patients, because they may cause symptoms[59,60]. One study reported more GI symptoms from carbonated beverages among IBS patients compared with controls. Recommendations on fluid intake in IBS, according to dietary guidelines and/or scientific literature: IBS patients should be advised to drink up to 1.5-3 L/d of fluids (about 35 mL/kg), especially water or other caffeine-free and alcohol-free non-carbonated drinks (e.g., herbal teas)[12,13]. Current dietary guidelines for IBS management[13,21] include recommendations on physical activity. This is due to the fact that physical activity serves as a basic complement to the diet. Regular exercise is beneficial to health in general and recent data highlights its positive effects also for IBS patients[62,63]. In several studies, mild physical activity has been reported to reduce IBS symptoms and enhance intestinal gas clearance, reduce bloating and relieve constipation[64-67]. The practice of yoga has also been demonstrated to improve IBS symptoms in both adults and adolescents[68,69]. Mechanisms suggested to underlie the benefits of physical activity in IBS are decreased splanchnic blood flow, neuroimmuno-endocrine alternations, increased GI motility and mechanical bouncing during movement. The impact of exercise on psychological symptoms has also been postulated as a potential mechanism and studies have reported positive effects on quality of life, fatigue, anxiety, and depression after moderate increase in physical activity in patients with IBS. Nevertheless, it should be taken into consideration that increased physical activity, particularly strenuous exercise, may actually worsen IBS symptoms. For example, moderate physical activity (e.g., brisk walking) has been reported to improve gut transit time, whereas vigorous physical activity (e.g., running) may act on the intestines as a stressor and result in “runners trots”[71,72]. Recommendations on physical activity in IBS, according to dietary guidelines and/or scientific literature: (1) The physical activity levels of patients with IBS should be assessed, ideally using the General Practice Physical Activity Questionnaire. IBS patients with low activity levels should be advised to increase their activity levels, while taking into account the needs, preferences and circumstances of each patient; and (2) IBS patients should be recommended to perform moderate physical activity, such as yoga, walking, cycling, or swimming, for at least 30 min a day, on 5 d of the week or more[13,21]. There is a guideline consensus that in case IBS symptoms persist while following general diet and lifestyle advice, the second-line intervention in IBS dietary management should include advanced dietary manipulations to alleviate symptoms, such as the low FODMAP (fermentable oligosaccharides, disaccharides, monosaccharides and polyols) diet[12,13]. The term FODMAP reunites a collection of poorly absorbed short-chain fermentable carbohydrates that are naturally present in many foods, including fructans and fructo-oligosaccharides in garlic and wheat, galacto-oligosaccharides in legumes, lactose in dairy products, excess fructose in apples, and polyols in stone fruits. FODMAPs can pass unabsorbed to the colon, where they increase luminal water through osmotic activity and induce gas production due to fermentation by colonic bacteria, which can result in luminal distension and GI symptoms in patients with IBS[74-77]. Moreover, recent studies show that the by-products of the interaction between FODMAPs and gut microbiota act on intestinal stem cells, resulting in aberrant differentiation of these cells into endocrine cells and leading to an abnormal density of endocrine cells in the gut. GI endocrine cells regulate GI sensitivity, motility, secretion, absorption, local immune defense, and appetite. Therefore, abnormalities in the GI endocrine cells may play a major role in the development of visceral hypersensitivity, dysmotility, and abnormal intestinal secretion, all being features observed in patients with IBS[47,78]. Relying on the role of FODMAPs in IBS pathogenesis, the low FODMAP diet restricts the dietary intake of these carbohydrates with the overall aim to improve IBS symptoms. Foods are classified into “high FODMAP” and “low FODMAP” and the consumption of the latter foods is recommended within this dietary approach (Table 1)[24,79,80]. Table 1 High FODMAP foods and alternative low FODMAP foods[24,79,80]. There is a growing body of evidence supporting the efficacy of the low FODMAP diet. Observational studies and RCTs have indicated that the low FODMAP dietary approach leads to symptom improvement in up to two-thirds of patients with IBS[81-83]. Many IBS patients will respond within 1-2 wk of initiating the diet, whereas some can take 3-4 wk to respond. Reducing the intake of FODMAPs may be beneficial for patients suffering of abdominal pain, bloating, flatulence, or diarrhea. Although the low FODMAP dietary approach appears to benefit many IBS patients, a recent RCT reported similar efficacy with the low FODMAP diet and a diet based on traditional dietary advice for IBS (e.g., regular meal pattern, limiting intake of fat, caffeine, alcohol). This provides support for further studies aiming to define the role of low FODMAP diet in the management of IBS. Furthermore, implementing low FODMAP diet can be challenging. One major challenge with this diet concerns adequate intake of fibers and calcium[12,87,88]. Likewise, restricting the dietary intake of prebiotic fructans and galacto-oligosaccharides can alter luminal microbiota[88,89]. Dietary counseling through a specialized dietitian is a key towards success of this fairly complex dietary approach. An experienced specialized dietitian can provide a detailed dietary plan that will ensure the low FODMAP diet is nutritionally adequate. Additionally, after good symptomatic response is achieved, the dietitian can help patients gradually reintroduce FODMAPs using a systematic food-challenge process to determine personal tolerance thresholds to individual foods. Recommendations on low FODMAP diet in IBS, according to dietary guidelines and/or scientific literature: (1) Low FODMAP diet needs to be provided by a healthcare professional with training in medical nutrition therapy and knowledge of food composition, such as a specialized dietitian[12,13]; (2) Low FODMAP diet should not be strictly followed over the long term[84,89]. A restriction phase of minimum 3 or 4 wk is usually sufficient to obtain a clinical response[12,84]. Then, FODMAP foods should be reintegrated in the diet to find the level of food restriction that the patient requires to properly control symptoms[12,90]; and (3) If no symptom improvement occurs within 4 wk of strict adherence to the low FODMAP diet, then the intervention should be stopped and other therapeutic options considered. The role of gluten in IBS is still unclear. A considerable proportion of IBS patients report symptoms in response to ingestion of gluten, despite no evidence of having either celiac disease or wheat allergy, a phenomenon that received the nomenclature of “non-celiac gluten sensitivity” (NCGS). Some of these patients may respond to a gluten-free diet. Several interventions have reported that gluten restriction for 4 to 8 wk improved IBS symptoms and reduced bowel movements per day and intestinal permeability[92-94]. However, the mechanisms underlying the beneficial effect of the gluten-free diet in IBS require further research. Wheat contains short-chain fructans as the main carbohydrate component. Therefore, there are reports suggesting that FODMAPs in wheat, rather than gluten, induce the GI symptoms in patients with IBS. Amylase trypsin inhibitors and wheat germ agglutinins have also been reported as components in wheat that may contribute to IBS symptoms[95,96]. In this context, is has been recently suggested that “NCGS” is a misnomer, as this term gives to understand that all symptoms patients experience following wheat ingestion are from gluten. It has also been indicated that a nomenclature more appropriate than NCGS would be “wheat intolerance” or “wheat sensitivity”. Recommendations on gluten intake in IBS, according to dietary guidelines and/or scientific literature: (1) If IBS patients wish to follow a gluten-free diet, they should be informed that the current evidence for its use is conflicting; and (2) If IBS patients decide to restrict gluten, they should be warned that an inappropriate gluten-free diet may be detrimental. Gluten-rich cereals are a valuable source of nutrients in the general diet, so their exclusion could potentially lead to nutritional deficiencies. Gut microbiota in IBS patients may differ from those in healthy individuals, suggesting an association between microbiota and the pathophysiology of IBS[99,100]. In this context, strategies aimed at modifying the microbiota in IBS patients have been increasingly explored in recent years. A particular interest has been given to probiotics. Evidence exists to suggest that probiotics may exert an effect in IBS through various mechanisms which target visceral hypersensitivity, GI dysmotility, intestinal barrier function, intestinal microbiota, and intestinal immune function. Several systematic reviews and meta-analyses have screened RCTs conducted on the effects of probiotics in IBS patients and demonstrated a beneficial effect of these organisms in the treatment of IBS[103-105]. However, it should be noted that the RCTs in these meta-analyses are somewhat difficult to compare. They are highly heterogeneous, show differences in the study design (size of the study, duration of the treatment) and use different probiotic species, strains, and preparations, some of which appear to be more effective for specific symptoms. For example, certain probiotics mainly reduce abdominal pain and flatulence[106,107], some reduce bowel movements, whereas others have a positive effect on global symptoms[109,110]. Despite these findings, in terms of type of probiotic to use (single species, strains, or mixtures), dosage to use and treatment duration, the optimal approach in IBS remains unknown. Thus, there is a clear need for further high-quality RCTs to provide additional information on the efficacy of probiotics as a therapeutic tool in the management of IBS symptoms. Recommendations on probiotics use in IBS, according to dietary guidelines and/or scientific literature: (1) Although probiotics seem to offer some benefit in IBS as a whole, the optimal approach in terms of which individual species, strains, or combinations to use, and at what dose and for what duration, remains unknown; and (2) IBS patients who choose to try probiotics should be advised to select one product at a time and monitor the effects. They should try it for a minimum of 4 wk at the dose recommended by the manufacturer. If within the 4 wk treatment, the probiotic proves to be beneficial, the administration may be continued, although the long-term effects are not known. Based on the current guidelines[12,13,21] and the existing literature on dietary and lifestyle recommendations in IBS[17,24,79,80], we developed the novel “IBS Food Pyramid” (Figure 1). It is a visual and user-friendly tool, to be used by healthcare professionals for the dietary counseling of IBS patients. The pyramid consists of nine levels. Within the pyramid, foods are arranged on the basis of recommended intake frequency in ascending order, from the most to the least frequent. Figure 1 Irritable bowel syndrome food pyramid. The pyramid was built upon the current dietary guidelines[12,13,21] and the existing literature[17,24,79,80] on diet and lifestyle recommendations in IBS. The pyramid consists of nine levels. At the base of the pyramid, it is emphasized the importance of regular physical activity, good hydration and healthy eating habits. Then, foods are arranged on the basis of recommended intake frequency in ascending order, from the most to the least frequent. Each food level also contains examples of what the patient can consume within a low FODMAP diet. 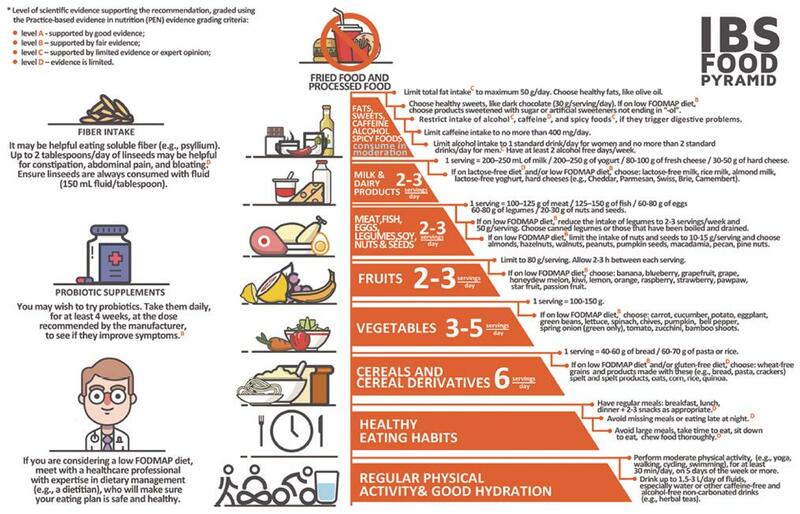 A pictogram on the left side of the pyramid highlights the importance of seeking specialized dietary advice in case considering the low FODMAP dietary approach. The other pictograms on the left side are accompanied by recommendations on the intake of dietary fiber and administration of probiotics in IBS. Recommendations have associated superscript letters symbolizing the level of scientific evidence that supports them. IBS: Irritable bowel syndrome. At the base of the pyramid, on the first level, regular physical activity and good hydration are considered. Moderate physical activity is recommended, such as yoga, walking, cycling, and swimming[13,21]. Recommendations related to frequency and duration, are at least 150 min per week, split into 30 min periods 5 times per week. Moreover, the consumption of 1.5-3 L per day of water and other noncaffeinated, non-carbonated fluids is recommended and water is represented in the pyramid[12,13]. On the next step, at the second level, are emphasized good eating habits that may favor the health status in IBS. The pictogram states the importance of regular eating patterns[12,13]. At the third level, cereals and cereal derivatives (e.g., bread, pasta) are shown. This group of foods provides a significant amount of the energy throughout the day. The recommended intake is 6 servings per day (1 serving = 40-60 g of bread or 60-70 g of pasta or rice). Vegetables occupy the next level. This food group is an important source of nutrients and bioactive compounds. The consumption of 3-5 servings per day (1 serving = 100-150 g) is recommended. At the fifth level, fruits are considered. Like vegetables, fruits are valuable sources of nutrients and bioactive compounds. The recommended intake is 2-3 servings per day (1 serving = 80 g). The sixth level shows high-protein foods, of either animal or non-animal origin, namely meat, fish, eggs, legumes, soy, nuts, and seeds. The recommended intake is 2-3 servings per day (1 serving = 100-125 g of meat or 125-150 g of fish or 60-80 g of eggs or 60-80 g of legumes or 20-30 g of nuts and seeds). At the next level, the seventh level, the consumption of 2-3 servings per day of milk and dairy products is recommended (1 serving = 200-250 mL of milk or 200-250 g of yogurt or 80-100 g of fresh cheese or 30-50 g of hard cheese). This group of food provides many nutrients, including important amounts of calcium. The eighth level is marked with the “consume in moderation” recommendation. This level includes potential IBS dietary triggers, namely fats, sweets, spicy foods, caffeine, and alcohol. The total fat intake should be limited to no more than 50 g/d, while choosing healthy fats, like olive oil[17,62]. Healthy sweets should be chosen and consumed sparingly (e.g., dark chocolate at 30 g per serving). Alcohol, caffeine, spicy foods should be restricted if they are related to symptoms. In the case of alcohol and caffeine, there is the recommendation to ensure the consumption is within the safe limits for the general adult population. The top of the pyramid, the ninth level, includes fried and processed foods, which should be removed from the IBS diet . Furthermore, each food level contains examples of what the patient can consume if deciding to follow a low FODMAP diet[24,79]. A pictogram on the left side of the pyramid highlights the importance of seeking specialized dietary advice in case considering the low FODMAP diet. The other pictograms on the left side are referring to the intake of fibers and administration of probiotics, respectively. The intake of fiber is recommended, with emphasis on the intake of soluble fibers (e.g., psyllium)[12,24]. Also, for IBS patients that decide to try probiotics, there is the recommendation to take the probiotic supplements daily, for at least 4 wk, at the dose recommended by the manufacturer, to see if symptoms improve. Recommendations included in the pyramid are accompanied by superscript letters symbolizing the level of scientific evidence supporting them, as graded in the recently updated British Dietetic Association evidence-based practice guidelines for the dietary management of IBS in adults. The evidence reviewed within these guidelines was graded using the Practice-based evidence in nutrition (PEN) grading criteria, as follows: level A - supported by good evidence; level B - supported by fair evidence; level C - supported by limited evidence or expert opinion; level D - evidence is limited. In recent years, dietary management has shown promise as a key tool in the treatment of IBS. A growing body of evidence exists to support the use of interventions such as the low FODMAP diet, although further well-designed, adequately powered, randomized controlled trials from around the world are needed to validate the efficacy of this dietary approach and assess its long-term benefits and safety. There is also ample room for improving the knowledge on other dietary approaches available to date, notably the first-line intervention on healthy eating and lifestyle, but also approaches such as the dietary restriction of gluten or the use of probiotics. Valuable data can only be obtained by future large, randomized controlled trials with rigorous end points.